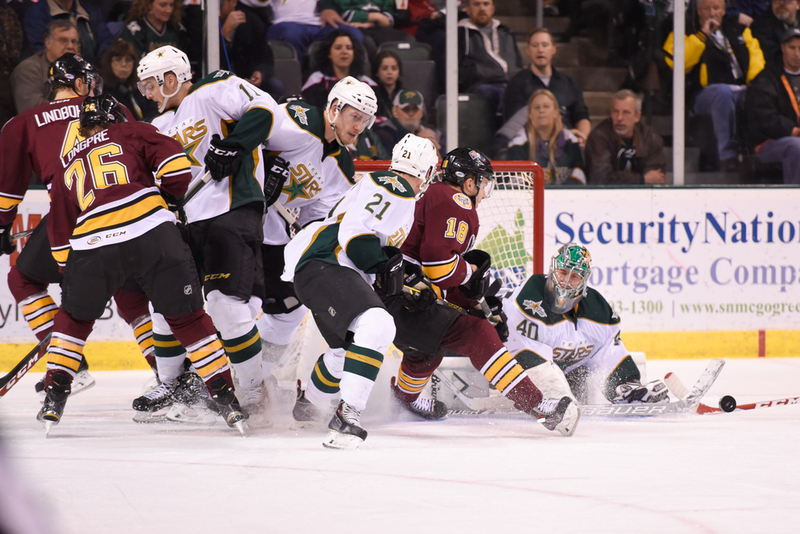 The Texas Stars played the Chicago Wolves last night and came away with a 3-2 win. Captain Max Fortunus played a fantastic game, racking up a pair of goals. Here are 3 shots of the action. My first pick is Fortunus giving net minder Rynnas a hand in keeping our net locked down in the first period. Next, is a shot of Gaunce following the puck sailing overhead. Yep, got to watch for those airborne pucks! The third pick is a shot of a jammed up Stars net as our defense keeps Wolves attackers at bay while Runnas stops an incoming shot.